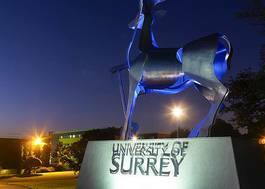 Study Business Management (Human Resource Management) with Foundation Year at University of Surrey - Which? Overall: CCC We do not include General Studies or Critical Thinking in our offers. Overall: 30 GCSE or Equivalent: English HL4/SL4 and either Maths HL4/SL4 or Maths Studies HL4/SL4. Overall: CCC GCSE or Equivalent: English Language: Scottish National 5 - C. Maths : Scottish National 5 - C Applicants must have achieved these Scottish National grades at the time of making their application. Overall: BBBCC GCSE or Equivalent: English Language: Scottish National 5 - C. Maths : Scottish National 5 - C Applicants must have achieved these Scottish National grades at the time of making their application. Overall: Pass overall with CCC from a combination of the Advanced Skills Challenge Certificate and two A-levels. Applicants taking an A-level science subject with the Science Practical Endorsement are required to pass the practical element. At Surrey Business School, we’re renowned for our world-class research, dynamic learning environment and strong links with industry. Our business management degree programmes give you the opportunity to explore how organisations of all sizes start, run and thrive. By combining this core business knowledge with specific expertise in human resource management on our BSc Business Management (Human Resource Management) **(with Foundation Year)** pathway, you will explore the human dimension of business and management – a complex but immensely exciting, rich and interdisciplinary area of knowledge. Our course offers a wide variety of modules on topics including organisational psychology, international aspects of people management, and employee relations, in addition to core business and management topics. We’re always looking to make it easier to access the education we offer, so we have launched the option of taking a degree with a foundation year. • You’re looking for more support during the transition into university study. To see the full range of modules for this course please visit our website. The link is under course ‘contact details’ to the right. You will also find full details of the programme, including assessment methods, programme structure, contact hours and Graduate prospects.